Description: Teach middle school students to become savvy consumers of the TV, print, and online media bombarding them every day. 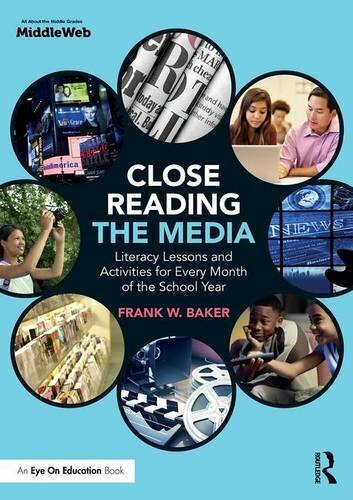 In this practical book co-published by Routledge and MiddleWeb, media literacy expert Frank W. Baker offers thematic, timely lessons for every month of the school year, so you can engage students in learning by having them analyse the real world around them. Topics covered include critiquing the messages behind Super Bowl ads, Christmas toy commercials, fall political campaigns, and more. Through these lessons, students will learn to read the media more closely and will improve their critical thinking skills. The book also offers classroom-ready handouts you can use immediately. The Media Literacy Clearinghouse is a nationally recognized media literacy resource website. Thousands of schools and organizations link to the Media Literacy Clearinghouse and many of his resources have been recommended by: Academy of Motion Picture Arts & Sciences; Access Learning; ASCD; Assn of Media Literacy; Australian Teachers of Media; Blueprint for Democracy; Cable In The Classroom; Education Week; Edutopia; INFOHIO; NCSS; NCTE; PBS; School Library Journal, and School Library Monthly. Media Literacy Clearinghouse makes available some copyrighted material. We understand our use of any such copyrighted material to constitute a "fair use" as provided for in section 107 of the US Copyright Law. In accordance with Title 17 U.S.C. Section 107, the material on this site is distributed - without profit and for research and educational purposes - to individuals expressing an interest in its subject matter. If you wish to use copyrighted material from this site for purposes of your own that go beyond fair use, you must obtain permission from the copyright owner. This website was part of a project originally started by the late Dr. Pete Johnson at the USC School of Medicine. I am eternally grateful for its hosting of this site from 1998-2006.